Car owners often get conflicting advice about oil filters. Vehicle owner's manuals, installers, quick-lube operators, mechanics and retail clerks all have different opinions. The reality is that when it comes to oil and filters, the only right answer is a customized answer. People are different. Driving conditions are different. The one-size-fits-all approach does not apply when it comes to oil filters. Control of solid contamination in diesel and gasoline crankcase oils has a well-documented effect on engine reliability. Besides wear and reliability, particle contamination can impact fuel economy, lubricant life and environmental issues. Increased service life and reduction in maintenance cost is commonly reported by drivers who follow good filtration practices. While the benefits of clean oil are significant, low-quality filters are frequently specified for automobile engines. Consider this, according to a study by one engine builder, particles smaller than 10 microns generated about 3.6 times more wear (rods, rings and main bearings) than particles greater than 20 microns. 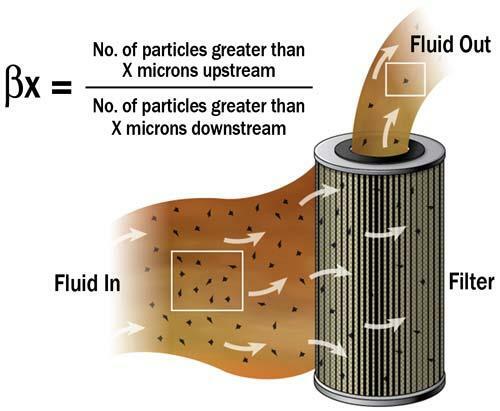 Typical automotive oil filters remove particles 40 microns and larger. 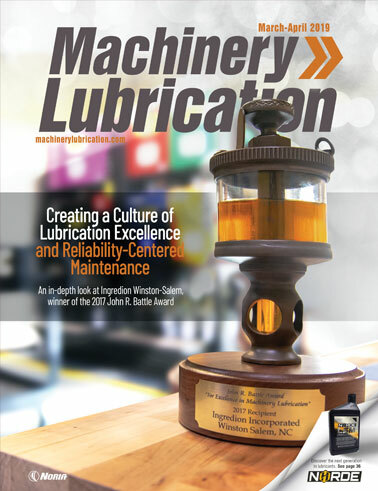 AC Delco Division of General Motors tested diesel engines and found an eight-fold improvement in wear rates and engine life with lower lube oil contaminant levels. In a related study on both diesel and automotive engines, General Motors reported that “compared to a 40-micron filter, engine wear was reduced by 50 percent with 30-micron filtration. Likewise, wear was reduced by 70 percent with 15-micron filtration”. Read that again. That's a lot of motivation for clean oil! There are many different types of contaminants that can enter an engine oil, and most of them have destructive potential. These include water, glycol, fuel, the wrong oil, dirt, wear debris, etc. Solid contaminants are generally referred to as being the most destructive. After oxygen, silicon is the most abundant element on the earth. Silica and silicates (forms of silicon dioxide) make up a large proportion of the earth’s crust in the form of natural soils and terrain dust. External contamination of lube oil by dust (silica and alumina) is generally regarded as the most harmful to engine surfaces. As a point of reference, both of these common particles are harder than a hack saw blade. Engine components do not have surfaces as hard as a hack saw blade. "These common particles are harder than a hack saw blade. Engine components do not have surfaces as hard as a hack saw blade." Particles of airborne sand and dust vary in size, shape and abrasive properties. In an engine, the ingress of terrain dust takes place primarily through the air intake. Efficient air filters remove 99 percent or more of the dust that an engine ingests. The remaining consists of very small particles that pass through the air filter. These vary from submicron-size particles to particles up to and larger than 10 microns. This abrasive dust will pass between pistons, rings and cylinder walls. Many particles will eventually become suspended in the engine oil. Those particles similar in size to the oil film clearance do the maximum damage. Those particles smaller than the working clearance will pass straight through, doing minimal harm. Conversely, a particle larger than the clearance will be swept aside and may do little damage. In an engine, the clearance between the piston ring and cylinder bore is extremely small, typically 5 to 10 microns. 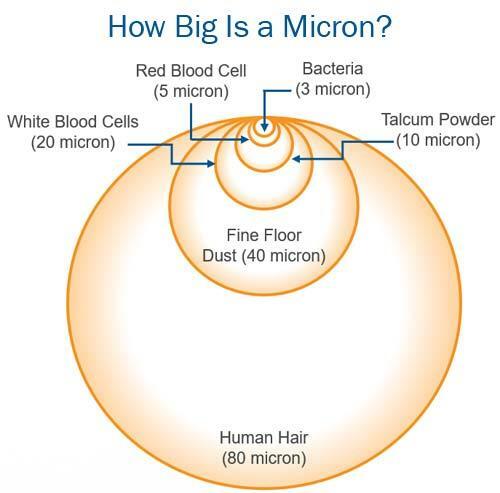 As a point of reference, one-thousandth of an inch is 25 microns, and a thin human hair is 75 microns. Human beings can see objects that are only 40 microns or larger, and bacteria is roughly 1 to 3 microns. As is always the case in motor oils, the number of small particles per milliliter of oil is much greater than the number of large particles. Approximately 80 percent of the weight of typical road dust is smaller than 25 microns. The high concentration of small particles in motor oils is also due to the fact that small particles are more prone to ingression from the environment. Large particles are more friable and tend to break into more and more small particles. Also, large particles are more easily filtered and removed by settling in sumps. Once the dust particle has entered an oil film, if it is the right size, it can bridge between the two surfaces. This nullifies the effect of the oil film. The primary effect is a cutting or “scratching” action as the interposed particle is pulled and rolled across the opposing surfaces. A secondary effect occurs in rolling contacts. The load concentrated on the small area of the particle leads to high surface fatigue, pitting and eventually larger craters or spalls. In controlling particle-induced wear and failure, the first priority is to take every practical measure to keep dust from entering the engine compartment. Despite the fact that gasoline engines use sealed crankcases, particles can still enter with new oil through dirty dipsticks and dipstick ports, defective air cleaners, etc. The next essential objective is to select the correct oil filter. For the same reasons it is important to customize the selection of a motor oil, there are several similar options and considerations that must be navigated when selecting an engine oil filter. Let's begin by talking about the oil filter working principle. Filters used for automobile motor oils are located immediately downstream of the oil pump. Cars are factory-fitted with full-flow oil filters, but some do-it-yourselfers will install bypass oil filters as well. Car engine oil filters are sometimes referred to as spin-ons because the filter element sits within a can that is attached to a base plate which is spun onto a threaded mounting post and head-plate on the engine block. A gasket or o-ring provides the seal between the base plate and the head-plate. The oil enters the can through openings on the outside of the base plate, travels outside-to-inside through the filter paper (media) and into a center tube. Provides exterior seal between the oil filter and engine at the engine head-plate and the base plate. Prevents deflection (movement) at the gasket-sealing surface. Heavy-gauge steel plate provides for threaded attachment to the engine. Provides flow ports for the oil entering and exiting the filter. Retains element end adhesive and the end of the pleated filter media. Provides an outlet for clean oil, and provides structural rigidity to the pleated media. Retains element end adhesive and oil filter media. Provides the essential filter area and pore structure needed for unrestricted flow, dirt-holding capacity, and particle capture efficiency. Provides internal element support to prevent collapse of the element in response to cold starts and high-pressure differential. Ensures that there is a suitable and constant load on the oil filter element to maintain the seal between the upper element end cap and the base plate, even during pressure surge situations, shock load and vibration. Steel enclosure of the filter element. Prevents contaminant backwash at shut-down and momentary starvation at engine starts. Typically made of nitrile or silicone. Silicone may remain more flexible in cold weather. The filter media must remove particles from the oil in the target size range (10 microns for instance), depending on the reliability objectives of the car owner. 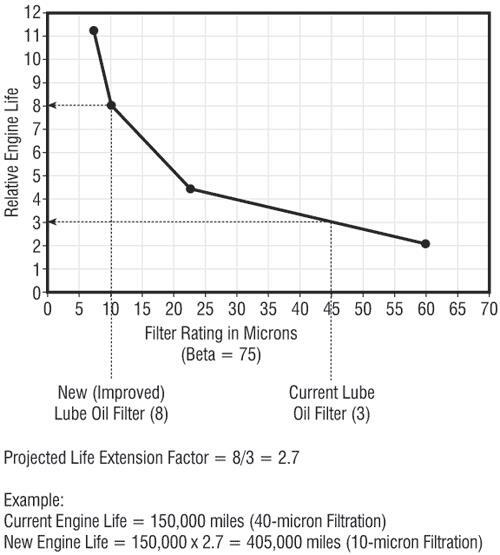 Obviously, a small micron-size oil filter is associated with lower wear rates and prolonged engine life (more on this later). The filter must also be able to remove particles fast enough to keep up with the rate new particles arrive into the oil (ingression rate). This is referred to as the contamination control material balance. In an engine, the pump circulates the oil in a multipass fashion, giving the oil filter more than one opportunity to remove particles. Most oil filters have anti-drainback flapper valves, but not all. The flapper is a diaphragm and is usually made of a soft elastomer material like silicone or nitrile. These valves prevent oil from draining back to the sump when the engine is turned off. There are two benefits to this. One is it prevents dirt from backwashing off the outside of the filter media and into the sump. The second is it keeps the spin-on canister full of oil. 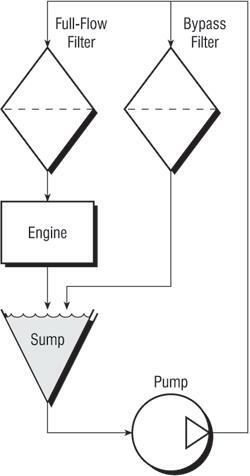 When the engine restarts, oil is immediately able to move into the main oil gallery and then to active zones of the engine without needing to refill the spin-on can - momentarily siphoning the pump supply. This avoids a dry start (oil starvation) of the valve train (especially overhead cam configurations), turbocharger and bearings. Such dry starts are reported to cause knock and rattle. The anti-drainback valve feature is typically also required when the oil filter is oriented in the horizontal or inverted position. Most car oil filters also have built-in bypass valves. The exception is when the bypass valve is permanently mounted in the engine block. A bypass valve is beneficial to avoid collapsing of the filter in case it becomes plugged before a change-out. Likewise, during cold morning starts, the thick viscous oil can momentarily bypass the filter without damaging it, until it heats up and thins out. Still, there is a real possibility that you can impair oil filter performance if you rev an engine on start when the oil is very cold. Revving an engine in that circumstance is never advised. The oil filter media is usually pleated to enable the largest number of square inches (square centimeters) of filter paper to reside in the small volume within the can. The filter paper is typically cellulose (wood pulp); however, newer, high-performance oil filters may be made of glass fibers (called synthetic media) or a composite of cellulose and glass. High-density bypass oil filters may have cotton linters, wood pulp and an assortment of other materials compressed or wound on a perforated center tube. 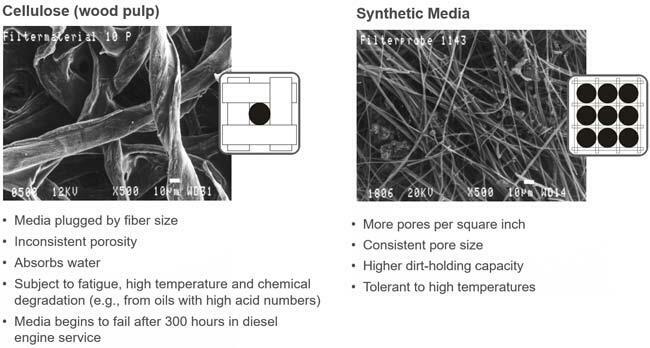 The construction of the media directly influences oil restriction through the media, mean pore size, capture efficiency and dirt-holding capacity. In general, large fiber diameter filter media is less expensive but will also have sharply fewer pores per unit area which diminishes performance. There are many different standardized test methods used to estimate the performance of a motor oil filter in service. These tests evaluate such things as collapse strength, burst pressure, single-pass efficiency, multipass efficiency, dirt-holding capacity, pressure-flow profile, impulse-fatigue, hot oil durability, vibration, bubble point and fabrication integrity. The SAE and ISO (International Organization for Standardization) have numerous standards covering these filter tests. The SAE J1858 standard is of more relevance from the standpoint of performance comparisons between commercial filter alternatives. This test, using a multipass protocol, determines the filter's Beta Ratio (capture efficiency), dirt-holding capacity (expected life of the oil filter) and pressure-flow profile. Unlike the SAE HS 806 standard, the newer SAE J1858 deploys online automatic optical particle counters located upstream and downstream of the oil filter during the test sequence. The test continues until the filter has reached full capacity (fully loaded) - all the while data is being collected at specific time points along the way. This unique capability enables the transient efficiency of the filter to be measured across a range of particle sizes. While all of the major oil filter companies have generally performed the SAE J1858 test on their automotive filter products, it is often difficult to find information on the results for specific oil filters. Rarely is such data actually posted on product packaging - the place consumers would most want to find it. However, if you enter “SAE J1858” into a search engine like Google, you will find a number of sites on the Internet, including filter suppliers that post filter performance data. The table below displays some of the data that was found during a Web search that lasted only a few minutes. (The brand names have been removed). If you're going to pay a premium to get a high-performance oil filter, look carefully at the capture efficiency (particle size retention) of the filter. For instance, an oil filter that has a capture efficiency of 95 percent for particles larger than 10 microns will remove 95 percent of the particles larger than 10 microns on a single pass and 5 percent of the particles larger than 10 microns will pass through the filter. It is worth noting that this performance property is a particularly large component of the premium price you're paying for good oil filtration. 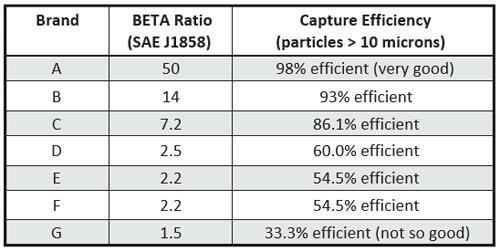 The most meaningful data to check is the Beta Ratio from the SAE J1858 standard (refer to table above to see how Beta and capture efficiency relate). We all but ignore the often-reported efficiency data from the SAE HS 806 standard (often called single-pass efficiency). The SAE HS 806 standard measures filtration performance by weighing the contaminant, not based on particle size or count. The sensitivity of engines to particles relates specifically to the size and concentration of the particles, not their composite weight. One large particle may have the same weight as a million small particles. Depending on your objectives in selecting an engine oil filter and your willingness to invest in the long-term benefits of clean oil and contamination control, the price of a premium oil filter can cost well over $10. This is especially true for oil filters with capture efficiencies of 95 percent or better at 10 microns, the performance we would recommend for those who want long engine life. The typical economy-grade oil filter is going to have a 95 percent capture efficiency at 40 microns, with almost no performance at 10 microns or less. The table below shows the capture efficiencies corresponding to several different Beta Ratios. Also, take note of the graph below illustrating how fine filtration translates into extended engine life (based on the GM study discussed earlier). While the particle capture efficiency provides important clues on the size of particles the filter can remove (and the stabilized cleanliness of your motor oil), the dirt-holding capacity reveals information about service life, prior to going into bypass. This is particularly important if you are attempting an extended oil drain and not planning to do a midpoint oil filter change. It's also important if you drive your car on dirt or gravel roads or in other dusty environments. Remember, unlike many large diesel engines, automobile oil filters have no indicator to tell you when oil is bypassing and not being filtered. Like the oil change interval itself, the optimum oil filter change interval is largely guesswork, hence the need for a suitable safety margin. Now, let's discuss the problem. The SAE J1858 and SAE HS 806 test procedures include the dirt-holding capacity of the oil filter being tested. However, filter companies generally prefer not to release data on dirt-holding capacity. In fact, after almost an hour of searching on the Internet, we were unable to find any data on dirt-holding capacity of motor oil filters. However, there's a good chance that if we called the customer support toll-free number of these filter companies, we could get the information we were looking for. It's a pity this information isn't conveniently provided on the product package or on suppliers' Web sites. Because oil filters can't be easily compared using this important property, the consumer is left with the only alternative of changing the filter no less frequently than say every 5,000 miles, leaving plenty of safety margin. And, we'll have to assume all filters perform equally on this property. However, we should mention that we were in the automotive oil filter-testing business for more than 10 years. When it comes to dirt-holding capacity, all filters are not alike. People often worry that if they switch from a 40-micron filter to a 10-micron filter for the sake of better contamination control and prolonged engine life that the oil filter will plug more readily, leading to restricted oil supply to the engine. We've already talked about the fact that these filters have internal bypass, so starvation is not a practical reality. When you think about it, the positive-displacement pumps used in automobiles deliver flow to the oil filter and then on to the engine at a rate proportional to the engine's speed. For instance, if the engine pumps 1 gallon per minute (gpm) at 3,000 rpm, at 6,000 rpm it will deliver 2 gpm and just 0.5 gpm at 1,500 rpm. In general, the pump will deliver the flow (assuming no inlet restriction or pump wear) regardless of the pressure restriction. As flow rate increases, so will pressure. A good rule of thumb is 10 psi increase for every 1,000 rpm. If the filter blinds off and both the engine's relief valve and the oil filter's bypass valve fail to open, this would be equivalent to dead-heading the pump. In such a rare case, the engine would have to stall out, the filter would have to burst, or the pump gears would have to strip - pretty unlikely. However, unexpected bypass flow can definitely occur if an oil filter plugs prematurely due to high flow restriction. In fact, it doesn't even have to plug, just revving the engine when the oil is extremely cold will crack open the bypass valve and may also force a puff of dirt through the flexing filter media. Most oil filters with internal bypass valves will crack in the range of 10 to12 psid (pressure differential in pounds per square inch). A new oil filter at engine idle speed may have only 1 psid of pressure drop (often much less). As dirt accumulates, the pressure rises and all the oil will be passing through the filter media until the bypass cracking pressure has been breached. As previously noted, the pressure differential is also proportionally affected by flow rate (engine speed) and viscosity. In addition, the filter flow restriction has an impact on fuel economy - it takes energy and power from the engine to push oil through an overly restricted oil filter. 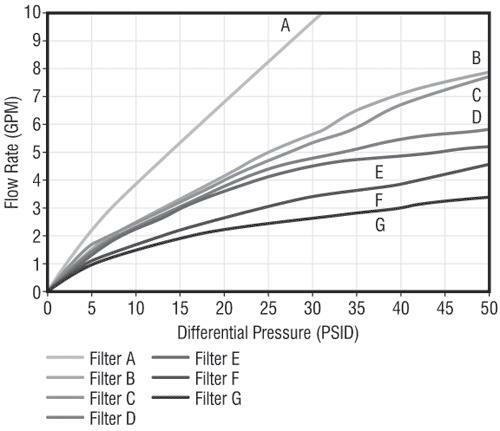 The figure above shows the pressure-flow profiles of seven commercially available motor oil filters. There is a test protocol in both SAE J1858 and SAE HS 806 relating to this filter performance characteristic. Unfortunately, this information on aftermarket oil filters is nearly as difficult to find as dirt-holding capacity. It is worth noting, however, that the major suppliers of motor oil filters are well aware of the importance of pressure-flow characteristics of filters, therefore, they design oil filters to meet or improve upon practical limits in normal service. This is accomplished by media technology (i.e., mean fiber size), peat construction and total media area. Car oil filters in the United States are made by only a handful of manufacturers. These include Fram, Wix (Dana), Hastings, Champion Labs and Baldwin. Many of these companies supply the oil filters that bear the brands of automakers, oil companies, mass merchandisers, auto parts stores and quick-lube operators. A close inspection of the can's shape and construction and the base plate usually reveals its manufacturer. Some materials are lightweight steel, plastic or cardboard. 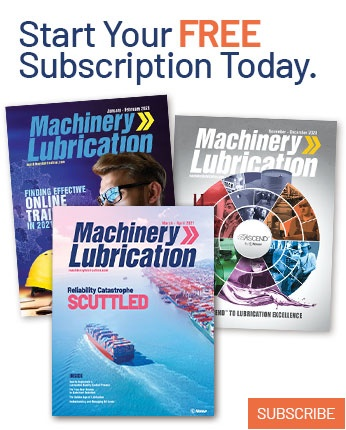 Their ability to stand up to long service intervals, repeated shock loading, vibration, thermal cycles, temperature extremes and changing motor chemistry may be marginal in certain applications and worst-case scenarios. Notice how the seam is formed where the pleats come together. Remember oil takes the path of least resistance. If there is any opening, crack or gap, that's where oil will flow, as will the abrasive particles. Some seams are stapled, glued to both. Are the pleats fanned out and loose or tight and firm? Are they supported by a wrap or a bead of adhesive to prevent them from bunching under pressure and squeezing off flow? Look at the bypass valve. Is it an elastomer soft-seat valve design or a hard-seat metal-on-metal construction? Hard seat valves may permit small continuous bypass flow which could negatively impact the capture efficiency of the oil filter. Use of plastic in the spring construction of the bypass valve may also be a performance/quality compromise in certain applications. On the anti-drainback, take note of the flapper valve and what type of surface it seats against. Ensure that the endcap is full of adhesive and that the adhesive hasn't wicked up into the filter media, breaking the seal between the media and endcap. Synthetic media will appear white and felt-like while cellulose will look like orange-brown colored cardboard. In general, a good oil filter has a strong burst-resistant steel canister, an anti-drainback valve that is flexible, allowing it to avoid back-pressure and leakage at cold temperature, a bypass valve that doesn't weep at normal operating pressures (causing bypass), and a strong filter element with supported pleats and endcaps/seam that are sealed tight. The design, construction and attention to detail in a premium automotive oil filter is important. Remember, oil filters cannot be tested for performance and structural integrity before they are sold. Is a Premium, High-Capture Efficiency Oil Filter Right for You? Today there are just a few high performance automotive oil filters on the market. Remember, just because you see words on package that describe the filter as deluxe, high-performance, super-efficiency, or darn-good, it doesn't mean you are actually getting a premium product. With a little bit of research, you can probably find the data you're looking for, the most important of which is the SAE J1858. The table below associates engine life expectancy with filters having Beta (X) ratings of 75 or greater, based on the GM study. So, is your car a good candidate for a premium, high-capture efficiency oil filter? For sake of discussion, let's define such a filter as having a Beta (10) 75 (98.7% capture efficiency for particles larger than 10 microns). There are many examples of high-end sports cars and even SUVs where the investment is high, as is the expectation of engine performance and reliability. Good application for premium oil filters. If you are involved in motor sports, then you will pay a premium for a competitive edge - power, endurance and engine reliability. Many professional racers don't use oil filters during competitive events to save the extra weight and power loss (energy required to push oil through the filter). I've often wondered if what is lost in weight and power can't be gained back throughout the race from lower friction (clean oil results in less friction in bearings and ring/cylinder wall contacts) and less wear (improved combustion efficiency). Some luxury sedans are so expensive it would clash with common sense to use anything other than the best filter. Cold temperatures put high fatigue stress on oil filters. Premium filters may resist collapse and particle migration during cold starts. Premium engine oil filters may also have improved and more responsive bypass valve mechanisms. If you've done the math (cost/benefit analysis) and believe your car, driving habits and climate conditions make your car the perfect candidate for extended oil drains, synthetics give you the best shot and a safety margin to boot. But a healthy oil with long service life is not the same thing as a clean oil. Synthetics provide no compensating protection for dirt. The longer an oil stays in service, the higher the concentration of small particles that grow in population because they travel right through the pores of the filter media unrestricted. Slow speed, high load (e.g., towing), long hills, high-mileage engine, long oil service-interval and high ambient temperatures are the worst-case scenarios. It's in these cases when oil films get thin and high wear rates ensue. Thin oil films mean your engine is more sensitive to small particles - the size particles that will be most abundant in your oil, especially if filtration quality and capture efficiency are poor to marginal. For the large number of auto enthusiasts out there who make sport out of eking every last mile out of their car, a premium oil filter probably makes sense. If we had to make a choice between a premium high-performance oil filter and the best synthetic oil on the market to achieve long engine life, we would definitely choose the oil filter and change our fighting-grade API-licensed motor oil at an appropriate interval. If you've chosen a low-viscosity motor oil, such as a 5W-20, your oil film at operating temperature will be thin. This increases your engine's sensitivity to smaller particles and increases your need to remove particles in that size range. Particle-induced wear is greatest in the size range corresponding to oil film thicknesses. Many installers, parts stores and even auto makers say the oil filter needs to be replaced only at every other oil change. While you may think you are saving money by this practice, it really is false economy. The filters on late-model car engines have been downsized to save weight, cost and space. Sometimes they're hard to find and reach. The quart-sized spin-on filter of the past has been replaced by a pint-sized (or smaller) filter today. You don't have to be a genius to figure out that a smaller oil filter has less cumulative dirt-holding capacity and perhaps higher flow restriction - a concern with high rpm's or low oil temperature engine starts. However, we have to trust that these smaller filters will be adequate for 3,000- to 7,000-mile oil change intervals; but there is real risk that they will blind off long before a second oil change at 8,000 to 15,000 miles. If your oil filter becomes plugged before it gets changed, the oil will go into bypass, leading to accelerated engine wear. When your filter goes into bypass, it is no longer working. While your engine will not be starved of oil, particle concentrations will continue to grow in the oil by as much as 100 times normal levels. When you have 100 times more dirt, you will have no less than 100 times more wear associated with particle contamination. Sadly, car makers don't build cars with oil filter bypass alarms. It is important to remember that the threads on a spin-on motor oil filter must also be the correct diameter and thread pitch (SAE or metric) for the engine mounting post. If you mistakenly attempt to install an oil filter with SAE threads on an engine that requires metric threads (or the reverse), you might damage the threads that hold the oil filter in place, causing leakage. Mismatched threads can also allow the oil filter to work loose. This would result in a sudden loss of oil pressure and the complete oil charge.